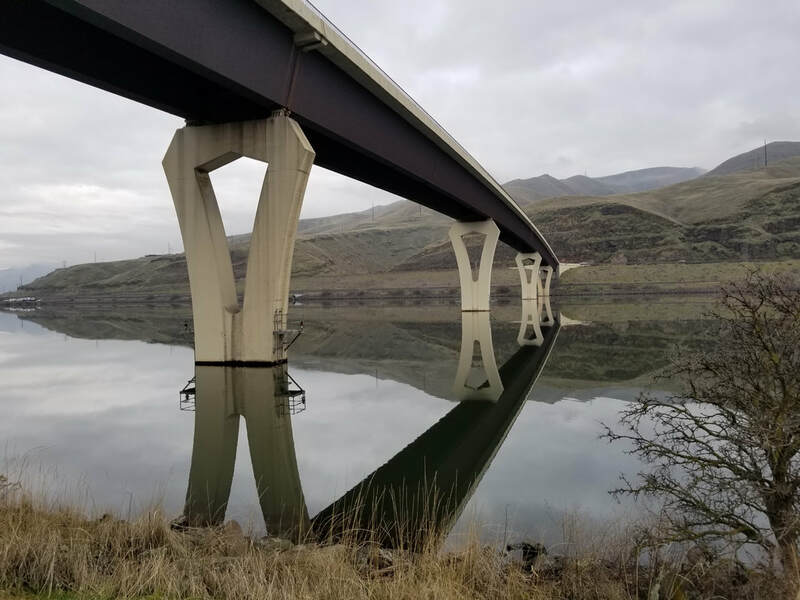 This WSDOT project is located in Omak, WA and includes hydro-demolition of the existing bridge deck and pouring a new 2-inch, modified concrete overlay. The hydro-demolition and overlay work is to be performed in two stages, with half of the bridge being completed before the next half starts. Work is to be performed during a full bridge closure that takes place from August 13, 2018 until August 28, 2018. Other notable scope includes expansion joint modification (strip seal), sealing bridge deck, core drilling deck drains, planing and paving HMA, striping, sawcut texturing, and traffic control. This project includes work on all four ramps between I-5 and I-84. 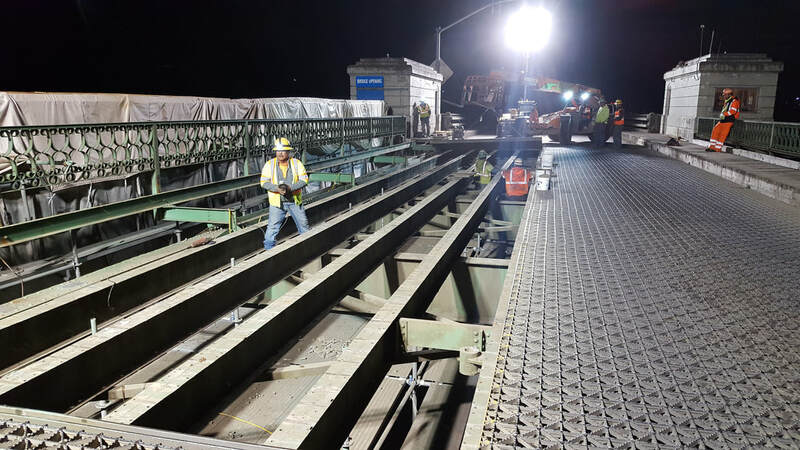 Work includes removal and replacement of existing bridge deck overlays on three of the four ramps, with Class II prep and deck seal on the fourth ramp bridge. Overlay work will occur under a series of full freeway ramp closures in July and August, 2018, with tight timelines to get all the removal, surface prep, overlay, and joint work completed. After completion of the overlay work, work will include F-Rail retrofits on three of the four ramps. This is single side F-Rail cast against the existing curb/parapet rail. Total rail quantity is in excess of 9,400-feet. Rail retrofit will take place under nightly lane closures and/or full weekend closures as necessary. Other work includes grinding/paving AC tapers at the bridge ends, replacing impact attenuators, and adding fencing to the rail over UPRR tracks. This project includes replacing the existing expansion joints on Bridges 5/337E and 5/337W on I-5 over Martin Way in Lacey, WA. The scope of work includes removing existing expansion joints and headers and replacing them with rapid cure silicone joints and elastomeric or polyester concrete headers. Other notable work includes planing bituminous pavement, replacing HMA at bridge approaches, removing existing ruts by cement concrete pavement grinding, installing pavement markings, and substantial traffic control. Construction includes replacement of a single 78-foot span precast slab sitting on 24-inch can pile. Work also included sheet pile wingwalls to prevent scour, landscaping, and stream restoration. This 36 working day project involves hydro-demolition of the existing bridge deck surface and placing a modified concrete overlay on the Red Wolf Bridge over the Snake River in Clarkston, WA. 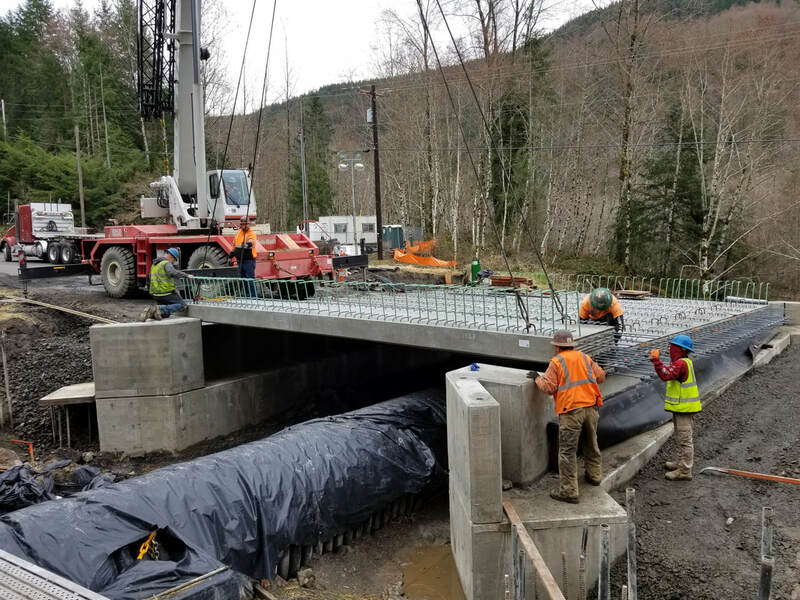 Other work involves replacing both compression and modular joint seal assemblies, bridge manhole modifications, steel corrosion coating on the interior bridge tubs, and grinding & paving the asphalt approaches. The bridge will be allowed to be fully closed from the first working day for a total of 30 calendar days to complete all of the work except the modular expansion joint systems. Work will resume for two subsequent weekends in September to install the modular expansion joint assemblies under a full bridge closure. This project is located on the Coos Highway at the south end of Coos Bay. The project is a structural, mechanical, electrical, and painting upgrade to the Isthmus Slough Bridge. The bridge is approximately 1,500-foot-long and has approximately 30 concrete approach spans with a steel deck truss span and bascule steel lift span across the river. Work includes concrete repair to the concrete approach spans and inside the pier houses on the lift span, steel grid deck and wood sidewalk replacement with plastic lumber on the bascule lift span, structural steel upgrades to the lift span including chord strengthening and addition of steel platforms and stairs, rivet replacement, replacement of span locks, span drive machinery upgrades, door and window replacement in the pier houses, cable furnish and barge support for the submarine cable replacement. Other work includes repainting the steel deck truss and bascule lift span, major electrical upgrades to the lift span, polymer concrete overlay and joint work to the concrete approach spans, epoxy injection work, HVAC installation in the pier houses, installation of submarine cables by divers, along with minor flagging, signing, striping, and asphalt paving. This project is located on SR 504, approximately 17 miles east of Castle Rock, WA, in Cowlitz County. The project includes the temporary diversion of Wooster Creek, construction of a temporary detour, removal of the existing culvert, construction of a new secant pile bridge structure, removal of the temporary detour, and re-grading the channel to existing conditions. The projects also includes, roadway, structure, and channel excavation, embankment compaction, shoring or excavation, HMA paving, erosion control, landscaping, beam guardrail, pavement marking, and traffic control including a temporary signalized shoofly and other work. This project involves the rehabilitation of the Burnside Bridge in downtown Portland. Hamilton’s work includes extensive concrete repair to the bridge, ornamental concrete rail rehabilitation, cofferdam construction, concrete strengthening of Pier 1, floorbeam strengthening on the concrete approach spans, concrete rehabilitation and ladder/rail retrofit inside the pit of the lift span piers, lift span re-balancing, and extensive traffic control. Other work involves painting rehabilitation to the steel spans over the river (including lift span), FRP and crack injection work, MPCO and polymer overlay work, joint repair and replacement, interior remodeling to the operator houses for the lift span, temporary barrier and three beam rail, electrical relocation and rehabilitation work, traffic control devices (signs, pedestrian barriers, etc. ), temporary and permanent striping, and environmental consulting and testing. 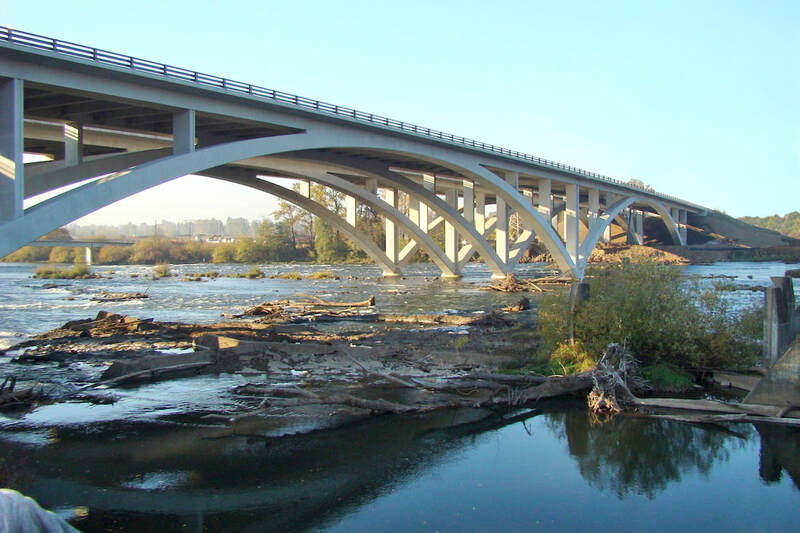 As General contractor on this project, Hamilton’s main scope of work is to install a cathodic protection system on the approach and tied arch spans of this bridge which spans the Siuslaw River on US101 in Florence, OR. Hamilton first began the renovation of this structure in 2009 when we made extensive upgrades to the mechanical lift system. 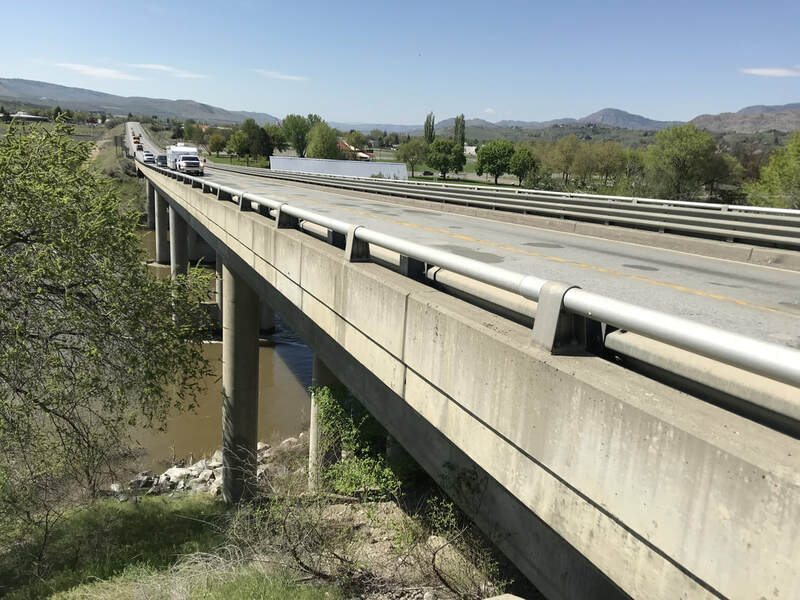 In addition to cathodic protection, work also includes replacement of the exiting ornamental bridge rail, installation of seismic restrainers and replacement of the existing bearings. 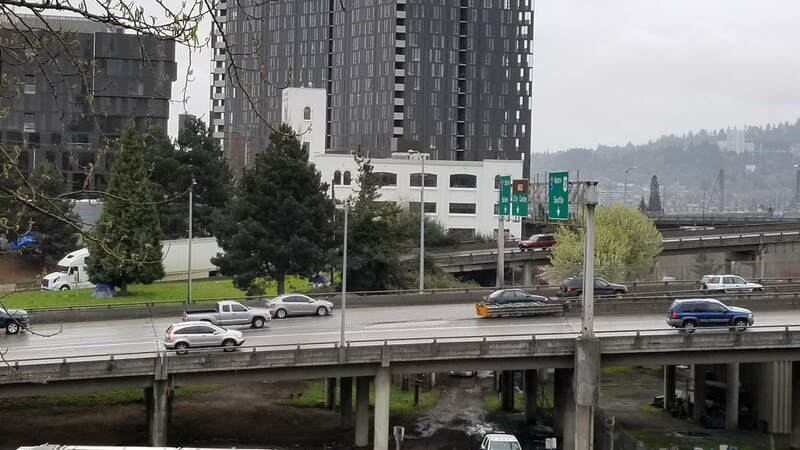 Just north of the Tacoma Dome, this $134 million project widens I-5 from Portland Avenue to the Port of Tacoma Road to provide room for a new HOV lane in each direction and four general-purpose lanes in each direction. Working with the Washington Dept. of Transportation, Hamilton will rebuild the I-5 Puyallup River bridge, reconstruct the I-5/SR 167 interchange, improve the Portland Avenue interchange and repave all the lanes on I-5 within the project limits. This project will provide a number of benefits to motorists: Improved safety, seismic upgrades, improved traffic flow, environmental improvements, and an Intelligent Transportation System (ITS) upgrade which will allow WSDOT to respond more quickly to highway incidents and reduce traffic delays. As General Contractor on the project, Hamilton’s work includes the construction of a nine span (1,600′ long x 100′ wide) precast girder bridge across the Puyallup River, as well as a four span (820′ long x 40′ wide) curved steel plate girder bridge for a new NB off ramp. Bridges are founded on 8-10′ diameter drilled shafts, cast-in-place (CIP) columns and X-Beams. Thirty spans of work bridge will be required to access the river bents, as well as major shoring required on the levees of the river. Other structural work includes 23 retaining walls of various types, deck repair, joints, end panel replacements on two existing I-5 bridges, three sign bridges, four cantilever signs, as well as deep 60 and 72″ storm sewer replacement with major shoring and CIP encasement work. Ground improvement work includes stone columns, cement deep soil mixing (CDSM), Jet Grout, Micropiles, lightweight fill, and embankment grouting along with an elaborate settlement monitoring system. Other work includes a large civil package, electrical, signing, asphalt and concrete paving, etc. as well as a major traffic control effort on a very congested section of I-5. 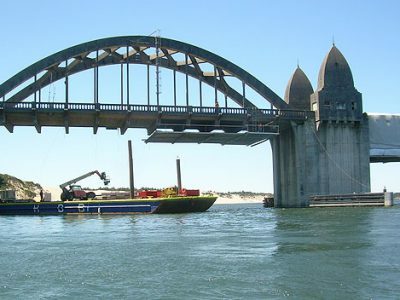 The rehabilitation of the 77-year old Conde McCullough Memorial Bridge has entered its second phase and once again, Hamilton Construction has been selected to help preserve this coastal treasure. (Hamilton recently completed a six year rehabilitation of the south approach of the bridge.) North approach work includes cathodic protection, concrete repair, bearing replacements, bridge drain retrofits, and seismic restraints. Hamilton will also construct 38 spans of work bridge along with structural support for the cathodic protection work enclosure. ​Cathodic protection: reduces saltwater-induced corrosion of bridge reinforcement steel by electrochemically “re-directing” the corrosive oxidation reaction to an applied surface coating of zinc. Bridge’s bascule lift span over the Willamette River. Our team is replacing the span with a steel grid/pan deck that will be partially filled with lightweight concrete. We will add approximately 850,000 pounds of steel counterweight plus another 75,000 pounds of precast block counterweight to account for the new, heavier deck. The crew is also rehabilitating and strengthening the trunnion bearings on the lift span including steel repairs and retrofitting existing steel rail across the lift span. 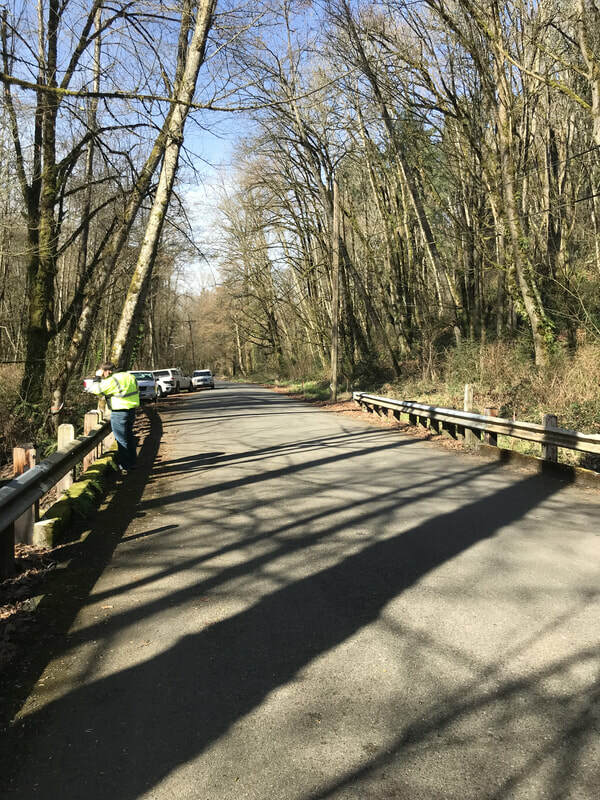 Hamilton is the Construction Management/General Contractor teamed with Multnomah County and Hardesty Hanover engineers to design, replace and repair elements of the draw bridge mechanism on this 103-year old structure. The most challenging part of the project will be the replacement of the massive 7,000 lb. rall wheel. This wheel enables the draw bridge to open up and roll back. In service since 1912, both the wheel and its track have become worn and pitted, creating concerns it could jam or come off the track. Safety and minimizing inconvenience to the public are top priorities on this project given its downtown location and heavy use by cars, pedestrians and bicyclists. Hamilton Construction was awarded the contract to build the portion of the project from Chehalem Creek to the connection with OR 99W on the south side of Dundee. This phase included six of the ten bridges that will be built for the entire project. Other Hamilton work included three monotube signs on spread footings and one sign bridge. There was a substantial grading/drainage package on the project. The majority of the new highway alignment is concrete paving with asphalt paving sections at the ends and overpasses. Hamilton was the Construction Manager/General Contractor (CM/GC) on ODOT's first CM/GC effort and the agency’s largest project to date. This $148 million project involved replacing an existing bridge with two new uniquely designed twin arch bridges and constructing a pedestrian/bike bridge in the midst of a sensitive habitat area with heavy recreational usage and a high volume of autos, rail, bicycle, and pedestrian traffic. 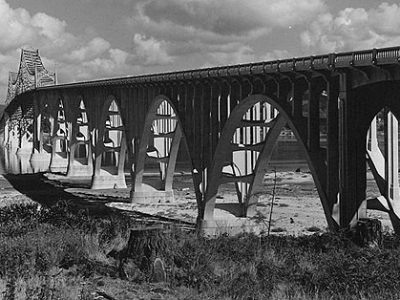 The new bridge spans the Willamette River, a four-lane highway, and a UP mainline. Each of the new structures are approximately 1800-feet long and feature a combination of deck arch and cast-in-place box girder spans. 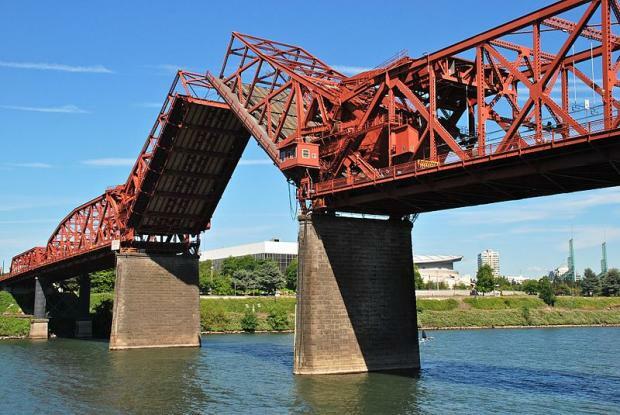 Demolition included: six 143-foot main spans of cast-in-place concrete box girders over the Willamette River; the reinforced concrete deck girder spans and a steel girder span in the approach structures; removal of 116,000+ sf of precast box beams, 2500+ lf of bulb-T girders with composite deck; and 1800 lf of steel plate girders with composite deck, concrete cap beams, concrete columns, and drilled shaft foundations. The project required complex arch falsework design and construction, extensive shoring, 140,000 sf of temporary work bridge, and many innovative solutions. Due to the high quantity of rebar in the footings, Hamilton worked with the ready-mix concrete supplier and owner to develop a site specific Self Consolidating Concrete (SCC) mix design. Work access for the majority of construction was via a Hamilton constructed work bridge. This project opened to traffic four months ahead of schedule, $15 million under budget, and was named Best Construction Project in the Pacific Northwest for 2014 by Engineering News Record.